When it first started up, The Isle of Arran distillery experimented with wine cask whisky releases. As the spirit (and the distillery) matured, the people in charge mostly discontinued the quirky cask approach. 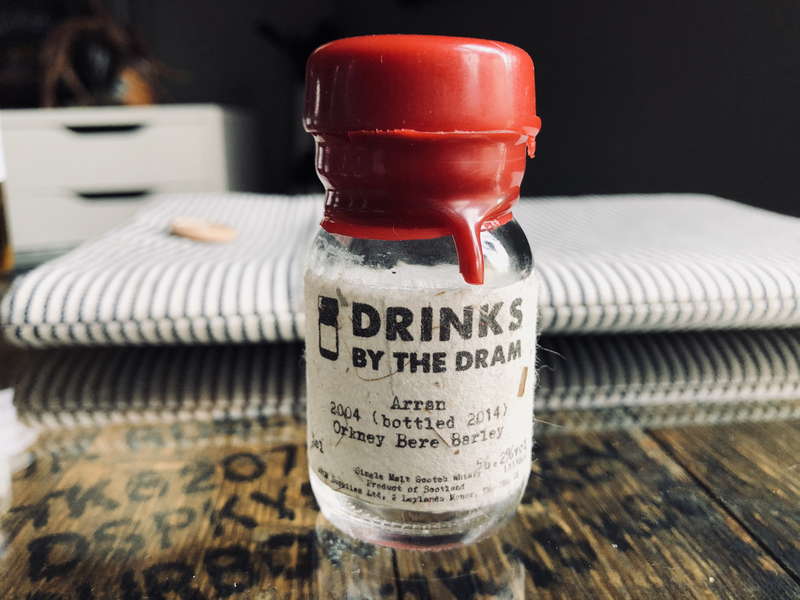 In 2004, Arran experimented with running an unknown number of batches of malted Bere barley spirit through their stills. That run has produced two releases so far, a 46%abv 8 year old and today's cask strength 10 year old. Yes, Bruichladdich and Springbank have both put out Bere barley releases recently, but don't start thinking Arran's a copycat. 'Laddie's first Bere release was distilled in 2006, as was Springbank's Local Barley 11yo, both two years after Arran's run. While Arran may not exactly be a pioneer with this stuff, kudos to them for giving Bere a go. It is difficult to grow and delivers a low alcohol yield. So one might say, that when compared to the mass-produced strains used by contemporary distillers, this old Viking barley can be a bit of a Bere. The nose leads with almond butter, soda bread and cracked peppercorns. It has both a gentle floral side and a wasabi edge. Hints of Italian sausage(!) and peach. The nutty note expands with time. Less alcohol heat than expected. But that flips in the hot palate. It's very grassy and earthy. Rocky. Peppercorns and a rugged bitterness. Some generic sweetness. Earth and herbs in the finish. The bitterness gets difficult, as if it's a long over-steeped cheap green tea. The nose is less edgy. But also just less. Nuts, grains and fruits are quieter. Some dried apricots in there. Very little change in the tough palate. It remains hot, herbal and earthy. Pencil graphite and peppercorns. Tangy and tart, like out of season berries. In the finish, there's earth, peppercorns, graphite and tingles. On the plus side, this is not an easy whisky, which offers a change of pace from Arran's often drinker-friendly products. Was that a plus? I don't know. It's very earthy and rocky and herbal. Those are plusses. When neat, the nose is very entertaining, zigging and zagging and burping up all sorts of quirky things. But there's is no complexity in the palate. And the finish is borderline unpleasant at times. Note, this is coming from a guy who likes austere (oh that word) whisky. I liked Bruchladdich's and Springbank's gambles with Bere better than this. And the 8yo Arran Bere Barley sounds MUCH better than this thingy too. So I'd be happy to try that one, but I don't need to drink this one again. That's a real shame. I was pretty excited about a cask strength release after enjoying the first one so much. Yeah, I was bummed I missed out on the 8yo. A reader told me on FB that this is his favorite Arran.